Successfully Added HK Warehouse HOMTOM HT3 Pro 4G Smartphone - 5 Inch, Android 5.1, Dual SIM, Bluetooth 4.0, Smart Wake, Gesture Sensing (Silver) to your Shopping Cart. 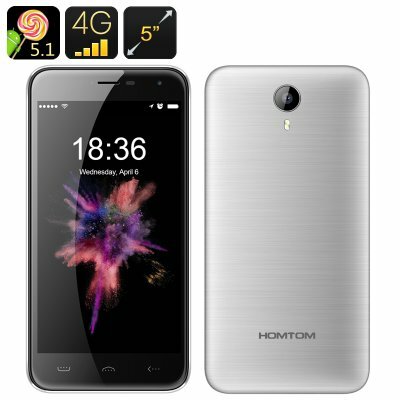 The HOMTOM HT3Pro Android smartphone comes with a classic design and a very affordable price tag. It features 4G connectivity, two SIM cards, Android 5.1, a 5 inch HD screen and more. With a powerful quad core processor and a 5 Inch HD screen, the HOMTOM HT3Pro smartphone is a great device for your media, gameplay and, of course, your basic phone functions. With Android 5.1, you will have a great interface to use and access to the Play Store. The smartphone offers 16GB of internal storage and supports up to 64GB more externally. Supporting two SIM cards, the phone lets you enjoy great connectivity while having two accounts on the same device. 4G network coverage will make sure you always enjoy fast web speeds and downloads. The HOMTOM HT3Pro smartphone comes with Smart Wake and Gesture Sensing. These two navigation shortcuts make things even easier, as you get to have access to favorite apps right from the locked screen and use gestures to manage your applications. With a 3000mAh battery, the phone offers up to 12 hours of non-stop talk time + 200 hours on standby. Bluetooth 4.0 support lets you hook up external gadgets like wireless headphones and speakers. You also have two cameras for preserving memorable moments. The HOMTOM HT3Pro Smartphone comes with a 12 months warranty, brought to you by the leader in electronic devices as well as wholesale Android Phones..